Old Dongola is part of the Tentative list of Sudan in order to qualify for inclusion in the World Heritage List. 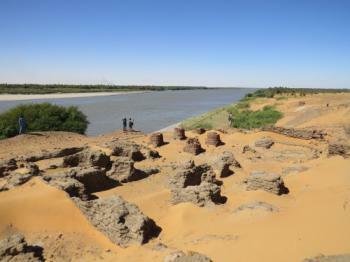 The ruins of Old Dongola are located on the East Bank of the Nile. As in Egypt, the Nile provides Sudan with a narrow strip of fertile ground. This area still has a number of colourful Nubian villages, where people live of the land (beans!). However, we arrived from the desert where we had been camping. The first remarkable sight in Old Dongola is the group of some 20 beehive tombs. These are of later date than Christian Dongola, but probably will be included in a nomination. I was pretty stunned by them, in the right sunlight they are beautiful. They are much bigger than I had expected. On the inside they are empty nowadays, except for significant numbers of bats. The Christian archaeological site lies uphill. It covers quite a large area, with palace grounds, churches and houses. From the fourth to the fourteenth century Old Dongola was the capital of the Makurian state and an important trade city. We (a Dutch tour group of 16 people) were the only visitors on site and I noticed no entrance regulations. After a while a caretaker showed up and followed us around on the 45 minute circuit along the remains of the buildings. Compared to Paul Tanner's photos from his visit in 2005, I found the site to be less covered with sand 9 years later. The church buildings seem to be fully excavated, but not much more is left than columns and walls. This part of the former town lies closest to the river. The Throne Hall is the most impressive construction still standing. Its interior is completely sealed off nowadays. "UNESCO is working on it", according to our guide. There's no sign of any work being done however. Supposedly there's an audience room with a painted floral band and a figures Christ and a Nubian bishop inside. Of course I was very curious about the state of the frescoes found at the Monastery of the Holy Trinity. The Polish archaeologists are still working on the site, but not today and it did not look like they've been present a lot recently. Earlier this year the protective covering above the monastery had collapsed due to heavy rains. It hasn't been repaired since. Fortunately we were able to see the frescoes and photograph them. They are in a Byzantine style and having their original colouring, but they are very hard to see. Most of them are damaged too. 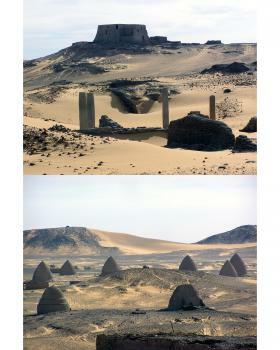 This was the first archaelogical site that I visited in Sudan, and I enjoyed it. It might not be spectacular enough to be in a Top 100 or even Top 500 of WHS, but while we are still adding sites from all over the world this one could surely make the cut. It is a testimony to a long and important phase in Nubian history. And I really loved those beehive tombs! We had first visited on our own the extensive ruins of the city which had flourished between 7th and 14 centuries. Although it is situated within view of the Nile (and the ferry crossing to reach it is an interesting part of the “visit experience”) it is today partially consumed by sand and doesn’t really give the impression of an ideal location for human habitation! In its earliest years it was the capital of the Christian kingdom of Makaria and some of the columns scattered among the dunes are marked with carved crosses. Photo 1 shows the “Throne Hall” high above the site with an indication of the ruins and pillars situated around it – these include the ruins of a 7th C cruciform church. The site also contains a number of later “Qubba” or tombs from more recent Muslim times (Photo 2). Next, as a courtesy on this Christmas day (but also with the hope of learning a bit more about the site than was immediately visible from the limited ruins poking above the sand!!) we paid a visit to the nearby HQ of the archaeologists who, we were told, were currently working on the site. Now, on my flight out from LHR I had noticed a bearded man and a team of students when they (with loads of equipment) boarded the same plane for Khartoum as I was on. There weren't many of us Europeans taking that route!! In Khartoum we went our respective ways - so it was a great surprise some 7 or 8 days later to be met at the dig HQ by the very same man!! We were just 3 “tourists” plus guide and driver but Dr Jakobielski did not stint in showing us round "his dig". The activity was centred on the ruins of the Monastery of the Holy Trinity. Most of these were below sand level where the archaeologists had uncovered stuccoed walls covered with Christian iconography. We were also shown into “back rooms” full of excavated fragments - mainly pieces of fresco in the process of being of being "reconstituted"!! He gave us far, far more time than we deserved. I will be interested to hear if, 10 years later, any of this dig is on public view. I particularly remember the story he told about the distrust he and his team faced from locals in the early days of his project. Since they were excavating remains from the pre-Muslim Christian period in Nubia there were ("unspoken" at the time but described to him some years later when “trust” had been fully created) local fears that the “real” purpose was to resurrect Christianity there!! Old Dongola had survived the original thrust of Islam up the Nile and didn't finally succumb until 1323, at which time the Cathedral was turned into a mosque. Back in 2005 there still seemed to be many years of excavation work remaining - Dr Jakobielski asked that we didn't photograph any of the fresco work we were seeing for other than personal use as nothing had yet been published about them - so I avoid doing so here. He made no mention of any possible WH nomination (and, back in 2005 I didn't ask him). The most recent Web pages I can find still seem to indicate that significant excavations are continuing. Amazingly a nomination for Old Dongola was "referred" by the WHC as long ago as 1993!! I wonder if the subsequent excavations have helped its case? Does Sudan even want to nominate a site with significant Christian aspects? Well - I have discovered this on the Web from early 2011. A series of training courses held to assist English-speaking African nations to prepare Nominations. Among the participants were representatives from Sudan - and their choice of site for the course exercise was ....... Old Dongola!! Now that doesn't of course mean that Sudan was/is definitely preparing to move on this site but it would seem to indicate a significant degree of activity!!! The following links lead to reports of 2 courses. After the first "The participants were then released to proceed to their various countries where they had to actualize the development of the nomination dossiers "
"Sudan as a state party is working on the site of Old Dongola on the Nile. This interesting site represents various culture as well as religions including Christianity and Islam. The team from Sudan have been quiet for sometime, a fact that may have been due to the transformation going on the country that involve election leading to the separation of the North and the South"
In all honesty there doesn't appear to be a great belief in this second report that Sudan was close to resolving the problems which had been identified with the draft nomination. On the other hand the people running the course haven't indicated a "No hope" - so the site may yet appear as a nomination. Although not as impressive as Meroe, Gebel Barkal etc, Old Dongola is still worth visiting if you are touring Sudan - and is unlikely to be missed anyway as it sits close to the “natural” triangular route based on Khartoum taking in those more famous sites, as well as being on the well travelled north/south route to/from Egypt. Its “Christian” roots provide an interesting entrée to the history of Christianity up the Nile valley and into present day Ethiopia as well as of the subsequent conquest by Islam.